Ticket prices for the Lone Star Classic are $10.00 per adult and $5.00 per student. The students have worked very hard to be ready for both group and individual performances. At the Lone Star Classic we strive to provide an environment that lets them focus on their performance without distraction, resulting in the best possible experience. With that in mind, it is critical that you arrive at least an hour before any scheduled performance you wish to see. This will ensure you have time to park, get your tickets and be at the venue to find a seat. Like other band events when a group or individual begins to perform, the doors are closed (or area roped off) and won’t be opened until the performance is complete. We do this in order to prevent distractions to the performers. 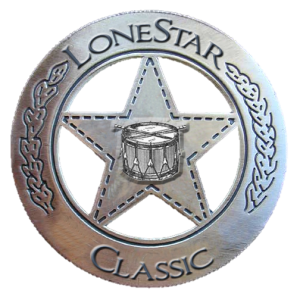 Is the Lone Star Classic Drum line Contest open to the public? Absolutely! We welcome the public. We enjoy seeing student alumni of the Lone Star Classic, middle school percussionists, interested elementary school students and one and all. How much does it cost to watch the Lone Star Classic Drum line Contest? Ticket prices for the Lone Star Classic are $10.00 per adult and $5.00 per student. This admission fee allows to you watch all the drum line and solo performances throughout the day in all performance areas. Tickets can be purchased at the gate. Do helpers have to pay to attend the drumline show? Parents and other assistants do not have to pay to help your show mobilize and set-up as needed. Directors will have an allotment of wristbands for students, drivers and directors. To attend any part of the show other than your own school’s performance, we ask they purchase an admission band. Do you have a “Lost and Found” at the Lone Star Classic? Can I purchase photographs of my drumline at the Lone Star Classic? Due to declining interest in professional photography, Lone Star does not have an official photographer. Carr Photography has been our official photographer in the past and can be contacted if you have interest in previous runnings of the Lone Star Classic. Can I purchase a video of the performance? Similar to photography, declining interest in video has led Lone Star to remove this video purchases. Does my entire drumline have to perform at the event for me to enter as a soloist? No. Soloist have a separate registration process. However, consideration will be made for solo performance times to not conflict with their drumline performance. What renowned percussion professionals have been past judges at the Lone Star Classic? View this years and previous Lone Star Classic judges.